After working as a pharmacy manager at Rite-Aid for the past 14 years, Rashid decided to open his own local independent pharmacy in downtown Edmonds. 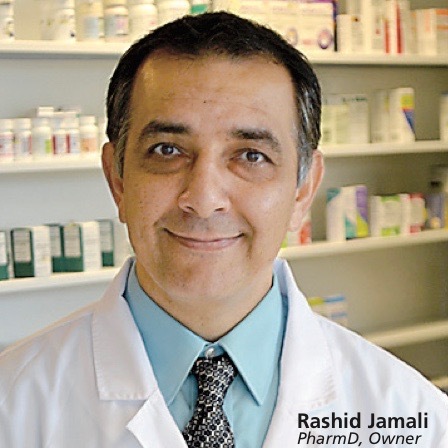 After working as a Pharmacy Manager at Lynnwood’s Rite-Aid location (on 196th Street SW) for the past 14 years, Rashid decided to open his own local independent pharmacy in downtown Edmonds. His focus is to provide fast services with the highest level of customer satisfaction, meeting and exceeding expectations. As a family-owned and operated business, this pharmacy embraces the opportunity to provide personalized attention, ensuring you that at you are getting the best service in town. Created by the Edmonds City Council in early 2013, Ed! is a focused, funded organization that supports and improves business conditions in Edmonds. Catch up with your Edmonds WA pharmacist by reading the “Ask an Expert” series in the local Edmonds paper “Edmonds Beacon”, where Rashid answers common health and pharmacy questions. "I have a local pharmacy - REALLY - local. I spend my money here in Snohomish county, and I feel comfortable it doesn't all go flying out of state to a home office in Rhode Island [...]. When we fill family prescriptions, they're always correct, they're always prompt, and if they can make any accommodation to help make things simpler for me, they go far beyond what any big corporate owned store would be willing to do." "This is the perfect hometown pharmacy with the kind of personal service that you would always want to have. Rashid is wonderful and a real gentleman. One could not ask for better or more caring service. He knows and cares for all of his clients and it shows in the service that we get."